“Clarissa” is the alias of a 28 year old Scholar from Texas, born in Mexico. There are nearly 1 million undocumented students. That’s a lot of smart, creative, self-motivated people who are ready to go to school and get a college degree and contribute to our nation. I’m a full-time student working part-time as a junior at the University of North Texas at Dallas. I’m majoring in accounting and hoping to work for a Big 4 firm someday. I am a self-proclaimed foodie and sports fanatic and love experiencing all of the wonders that America has to offer. I was brought here from Mexico when I was 10 years old and have lived in America ever since. I found out that I was undocumented when I was 16 years old and in search of a summer job. When I found out that I needed an ID, I asked my parents to take me to get one. The next day a stranger showed up at my house with an outdated camera to take my picture and make me a fake ID. For years, I had gotten my picture taken for the school yearbook, but this was different. I felt unsettled as I began to piece together the situation. Growing up here was difficult for the first few years. It was hard to make friends when I struggled to speak English. After learning the language, things got easier. In high school I played soccer and volleyball, was in French Club, and took AP classes. I received my DACA status in 2012, and learned about TheDream.US scholarship from Facebook. Without DACA and TheDream.US, I would probably be working at the local community college for subpar pay with no end in sight.If DACA is revoked without a bill for DREAMers passing, I’ll be devastated. Without it, I will be forced back to a life of being chased and feeling targeted. I will feel the same sinking feeling that came over me the day that photographer came to my home to make me a fake ID so that I could help support my family. DREAMers are driven and dedicated people who want to make the place they call home a better. 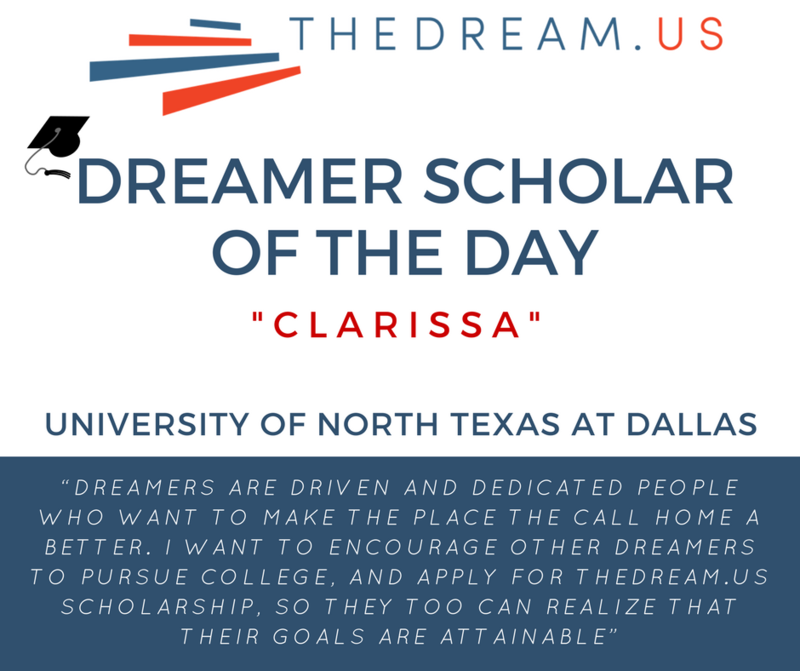 I want to encourage other DREAMers to pursue college, and apply for TheDream.US scholarship so they too can realize that their goals are attainable, and know that they do not have to run.